Learning from failure is not a new philosophy. It’s as old as they come. Dhruv Avdhesh from Delhi, however, has taken the idea a step further and wants people to celebrate failure, which is something he thinks he did too. Sounds like a philosopher? Or another inspirational speaker? Dhruv, at the ripe young age of 20, is but a college student whose voice, by the sound of it, hasn’t even cracked yet. 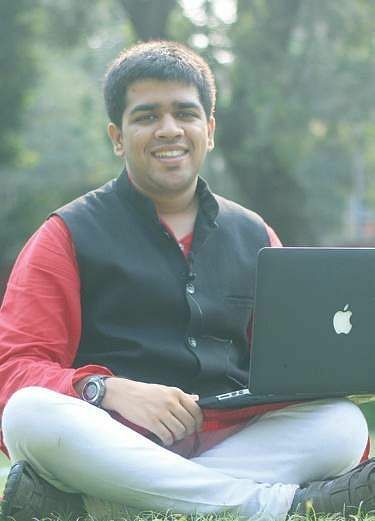 A third year student of B Tech in Mathematics and Computing Engineering from Delhi Technological University (DTU), Dhruv missed out on getting into an IIT. In his first semester at DTU, he, having been academically brilliant throughout school, failed in three subjects. He was also terminated from an internship on “utterly baseless” grounds of lack of talent, inability to produce desired results and low productivity. So then, he decided to focus on what he had loved doing since class VII — build websites. 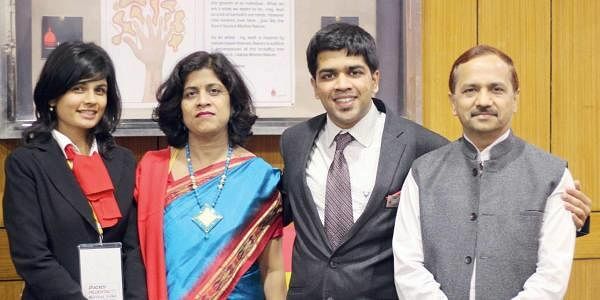 Two years later, with 20 websites and 27 projects behind him, Dhruv is a much sought-after person for building websites and other tech projects, is a student partner of Microsoft, has his own office and is on the verge of getting his first book published. Titled Celebrating Failure, the book, to be released in February 2017, is an anthology of 15 distinguished individuals who faced failure many times and got past it to where they are now. What made you think of writing a book, and that too in this particular format? The idea was in my mind for 8-9 months. I had been doing a lot of projects for the Young India Challenge, whose core message is “do the work you love.” While doing that, I realised that I, in spite of facing setbacks such as the internship experience and failing three subjects, was doing what I love. So I felt you have to kind of celebrate your failures to move ahead. Right now I think I’m in a good place. Frankly I’ve not seen enough of life to say I’ve seen so much failure to write a motivational story about myself. So I wrote about 15 people from different environments who celebrated “failure” and reached a certain level. I have spoken to all the 15 people. What was your takeaway from the process of writing it? A lot has been said about learning from failure, and what I learnt is failure doesn’t just mean failing in exams or a career, as is the general perception. I spoke to artists like Nehha Bhatnagar and Archy J and for them, failure meant their work not reaching the masses when they began. They had to try a lot of different things to get to where they have now. Like Nehha’s mother was pushing her to get married a few years ago. Archy gets thousands of views for her videos now but initially the number of views were too few. So there are different kind of failures, just not materialistic ones. Sometimes they are more like challenges. Did you take time off from doing projects to write the book? Yes I stopped taking projects and was fully devoted to writing the book. I got lots of opportunities and a client was offering 60-70,000 and said they were waiting for me. But I stuck to writing. Yes, it is already in the process. The book discusses what the youth wants from India and what it means to them. The book is going to break a Guinness World Record as I will interview about 10,000 interview, starting this January, for the book. Let’s rewind a bit. You were good in academics until class X. Did you try to get into an IIT? My AIR was over 9,000. With that rank, I wasn’t getting admission into a Computer Science course anywhere. So I joined this course at DTU of my own will. So you were always good at academics, and yet failed to clear three subjects in your first semester. What happened? When you get into a big college you start thinking your life is sorted and so, you get complacent. And when I just got into college I was still in the MCQ mode due to all the JEE preparation I was doing. And here you’re supposed to write subjective answers so there’s a big transition. I failed in three subjects out of ten. Interestingly, I failed by just 2-3 marks in all of those. Was that a tough time for you? How did your parents react? Yes it was. I had never failed any subject in school and was, in fact, usually one of the toppers and I suddenly had this fall. My parents were angry with me and concerned too. At what point did you decide to focus on pursuing your interests, which was building websites? That began in the second semester. By then I had started figuring out what college life is like. I also moved from my home to a PG near college which cut down my travel time and also gave me more freedom to do my own thing. Then I started taking up projects. My first project was to build a website for Young India Challenge. I did a couple of projects for free and got paid Rs 1500 for the first time, and then 2,000 and so on. How did you get these opportunities? I was very active in college. A close friend, Kamal Seth, had come to college for a series of lectures. There I met him and he was looking for people for his start-up. I offered to work for free, he took me on board and the website came out to be really nice. So he started recommending me to other people. Simultaneously I attended many conferences in and around college. Have you never had trouble balancing both — building websites and keeping up with your course? Honestly, I’m not a very good performer. I maintain an aggregate of 60-65 per cent. Now I don’t mind that because I feel it’s more important to have practical skills than bookish knowledge.